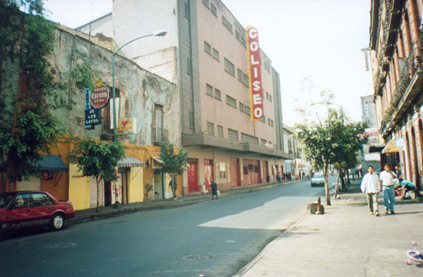 Arena Coliseo (usually) refers to CMLL's current secondary Mexico City arena. Arena Coliseo was opened on April 2nd, 1943 as EMLL's main arena, replacing Arena Nacional. The building has been in constant use since. Recent years (2000 and on) has seen fewer shows per year in the building in favor of Arena Mexico. CMLL currently only runs some Sunday shows here, down from the days of running three or more shows per week. Arena Coliseo has also been the home to boxing cards and other events. Arena Coliseo opened with a capacity of 8,863. It currently can hold 5,250 for a lucha libre event. The address is República de Perú 77, Colonia Centro, Delegación Cuauhtémoc, CP 06010, México, Distrito Federal, Mexico. The phone number is +52 55 5526 7765. Arena Coliseo can also refer to other arenas, as it's a common name. There are "Arena Coliseo"s in Guadalajara, Acapulco, Monterrey, and many others. This page was last edited on 17 September 2015, at 20:56.